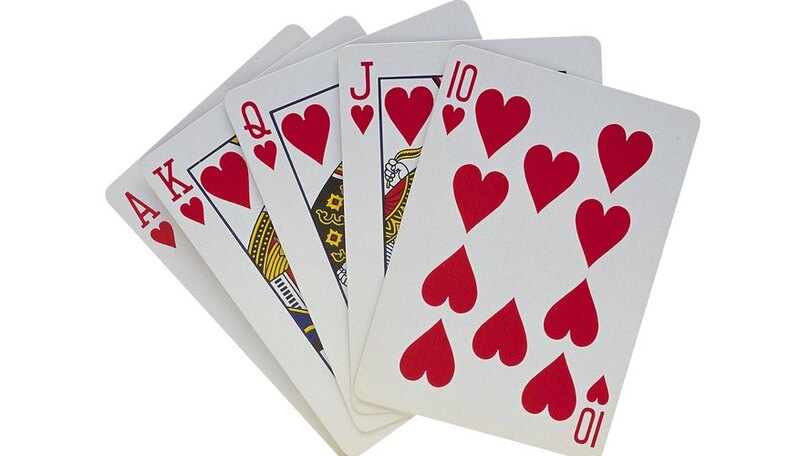 Playing cards are typically made of cardboard and often become bent if mishandled. To keep the corners and body of the playing cards from being damaged, make a card holder from plastic canvas material. Supplies from a hardware store will be needed as well as some items commonly found in the home. Place the plastic canvas on a work surface. Draw a 2-1/2-by-9 inch rectangle on the canvas with a ruler and pencil. Cut the rectangle out of the canvas using a straightedge and the blade of a utility knife. Smooth the edges of the cut rectangle with fine-grit sandpaper for two minutes. Wipe the edges free of dust with a water-moistened paper towel. Let the plastic air-dry for an hour. Make a second rectangle from the canvas in the same manner as was just done. Place one of the cut rectangles vertically on the work surface. Apply a line of bonding glue to the left and right sides of the rectangle. Apply a line of bonding glue to the end of the rectangle that is closest to you. Place the other cut rectangle vertically on top of the one that has been glued. Press the sides and bottoms of the two rectangles together for a minute before letting go. Let the glue set overnight. Hold your card holder with the open end at the top. Insert cards vertically into the end of the holder with the backs facing away from you. Don't let the bonding glue get on your fingers as it can pull off skin.